BetOnline is well respected online gambling company that has been in operation since 1991. BetOnline accept sports bettors from the U.S. Their racebook app is compatible with Apple iOS, Blackberry, Android and more. 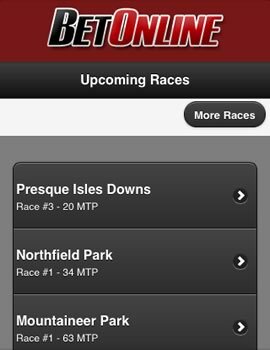 BetOnline Mobile works on Android, iPhone, Blackberry, Nokia, Windows & more. United States sports and horse racing bettors welcome. Supports Bitcoin banking. Place Win, Place, Show, Exactas, Trifectas and Daily Doubles from any phone. Up to 7% rebate offered daily on horse racing bets placed via the mobile site. BetOnline is an American based bookmaker that has been in the industry since 1991. They are one of the longest serving online bookmakers and have managed to build up a stellar reputation on the back of providing a consistent betting experience for its punters. BetOnline is one of the few internet sportsbooks that accept bitcoin. Whilst it will come as little surprise to hear that company mainly concentrates on American sports such as American football, Ice Hockey and Basketball, BetOnline have branched out further afield to accommodate that of their European users with sports such as soccer, golf, boxing and more. 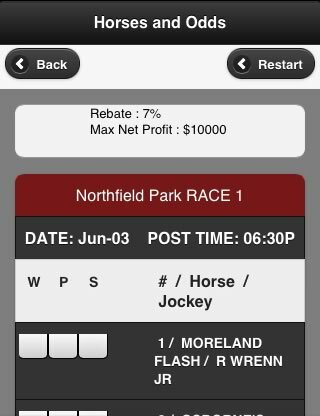 This review will be looking solely at how the horse racing section of their betting app performs. Whilst the mobile sector of BetOnline is still relatively new, the company has yielded good results for the online sportsbook, so we see no reasons as to why this shouldn’t be the case for their betting app. Upon first entering the app you will, obviously, be greeted with the BetOnline home page. Now the page in terms of aesthetic is less than appealing. It seems as though the app has been on a very tight budget and all that’s listed is information about your account, cashier then random markets. There are neither sports lists nor any real indication where you need to go to access each sport. In fact the only sport that is listed, luckily for us, is horse racing. So let’s dive straight into that section for the remainder of this review. The horse racing section actually loads as a new ‘racebook’ and the design, we are glad to report, is much, much more appealing. It’s pretty simple, but compared to the apps homepage, is worlds apart. Basically all you get in this section however, is a list of the upcoming horse racing markets to bet on. This includes where the race is taking place and the race number. 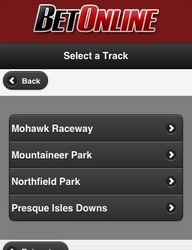 The app does include a ‘more races’ section which lists the meetings in order so you can select each from there. This to us would seem to make much more sense as the home page to improve navigation on the app. After choosing your meeting you then get to see an overview of the races that are taking place and also the times in which they are going to start. The times are US based, so any users using the app outside the US will have to factor this in as there are no settings to change this feature. After you have selected your race you are then taken to the markets section for that race. European bettors will likely find this structure a little different, but in the US the range of markets are vital and actually, this is a feature we really like. Depending on the race will vary the number of markets but these can include win/place/show, exacta, exacta box, trifecta, trifecta bos, superfecta, superfecta box, daily double, pick 3 and pick4. Selecting each will vary the market that comes up, but the main one will be the win/place/show market, which is essentially the same as the win and each way markets European bettors will be much more familiar with. The race card itself follows the simple theme that runs throughout the app. You get to see the name of the horse and the jockey whilst having three boxes next to that name. You simply choose if you want to place a winning bet, place bet or show bet then select the amount you want to place on this bet. This is where the app gets really confusing. At no point whilst placing a bet do you get to see the odds for that horse. 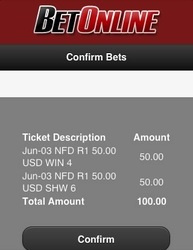 Even after placing the bet there are no indications to the odds you have just received. This is simply mind blowing as betting is all about choosing the right odds for your horse. This just makes it a total lottery. 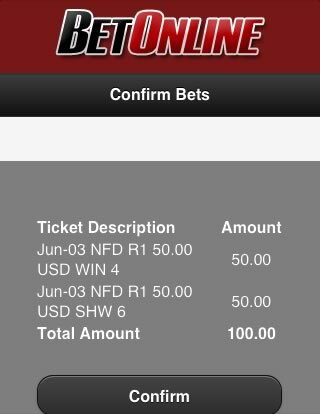 Even after checking your unsettled bets there is no sign of any odds, just simply how much you have wagered. BetOnline offer a range of betting promotions and offers that make it a very attractive racebook for both existing and new customers. First off they uniquely offer their players up to 25% in free play bets on EVERY deposit they make for life. Your first in-play bet at BetOnline can also be risk free thanks to their live betting 25% free play. In order to encourage their online players to try the mobile app, BetOnline are offering a $50 free play when you place your first bet from any phone or tablet. 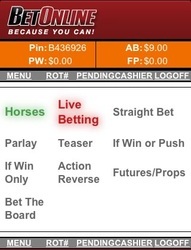 In addition, BetOnline also offer a daily rebate of up to 7% on all horse racing bets. 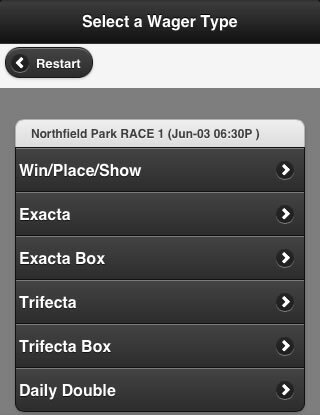 This has been a strange app to review in terms of the horse racing section BetOnline. We came in with high hopes as the bookmaker offers a great variety of sports and markets online and we expected this to shine through in the app. The app in reality is miles behind many of its rivals. Its design looks really dated and more like something from a BETA test in the early 2000’s. 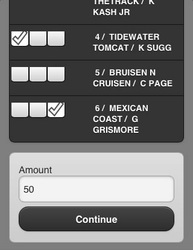 Granted once into the app the range of markets that you can bet on for each race, and also range of bets are superb. In fact, probably as good as you’re going to get. But the lack of odds is simply unforgivable and an aspect we simply find ourselves scratching our heads about. It’s hard to find positives from this app to be honest and it’s even harder to understand why many racing fanatics would use it to bet with. A dissipating effort from BetOnline to say the least!